“The Don Reno Story, Part 1: The Early Years,” interview with Bill Vernon, Muleskinner News, June, 1973. What stands out in remembering Don Reno was his energy. He was capable of writing 10 or 15 songs at a stretch. He could hold an audience’s attention for every moment of his live performances. He worked marathon recording sessions and traveled hundreds of miles between shows. Coming of age in the Depression and World War II, Don never achieved great economic success. Rock and roll arose just as his career began to blossom. Although he earned fame, the attention he received from the recording and broadcast industries and the size of his audiences suffered accordingly. 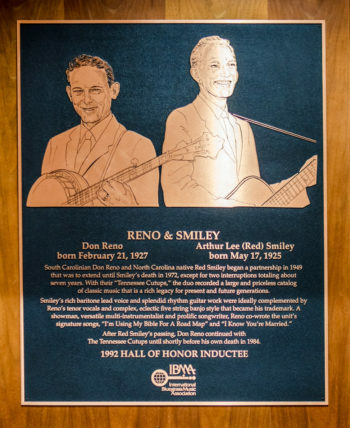 Don Reno’s legacy in bluegrass was under-appreciated in earlier days. His approach to music was more innovative than traditional, so he received less attention from folk scholars than some of his peers. He wasn’t based in Nashville, and recorded for labels that had regional or limited distribution. But new generations continue to discover and treasure Don Reno’s huge recording catalog and a few surviving live show tapes and videos. Don Reno was born in Spartanburg, South Carolina, and reared in nearby Clyde, North Carolina. His immediate family wasn’t musical, but much-older brother Harley married a girl whose brothers had a band. From that source, Don was exposed to fiddlers Art Wooten and Tommy Magness. The first time he picked up a banjo, at the age of five, he found that he could play “Brown’s Ferry Blues.” He and a friend improvised a banjo, and Reno owned a guitar by the time he was eight. 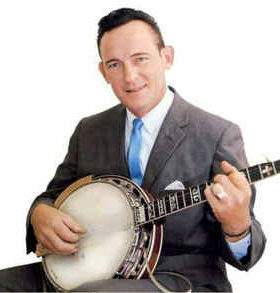 Snuffy Jenkins was his direct influence for a three-finger banjo style. With eclectic musical tastes, Reno injected blues and jazz into his playing. He wavered between guitar and banjo, and was a star on both. Before his teens, the young man was performing on the radio, first as a solo act on guitar and harmonica, then as a banjoist for the Morris Brothers. Earl Scruggs visited the radio station where they played, and replaced Reno with the Morris Brothers in early 1942. Don went on to Arthur Smith and his Crackerjacks, where he played a variety of instruments and performed comedy. In 1943, Bill Monroe came through town and offered Don Reno a job as his first banjo player. Reno, however, determined to join the Army, passed his physical, and was inducted in March of 1944. He turned down a musician posting (terming it “a chicken job”) and served as company barber with Merrill’s Marauders in Burma and China. After the war, he operated a South Carolina grocery store and played jazz and country music at night. In 1948, hearing on the Grand Ole Opry that Earl Scruggs had left Bill Monroe, Reno drove to Nashville and then to Taylorsville, North Carolina. Without invitation, he uncased his banjo and joined the band onstage in the middle of their performance. Reno stayed with them until July of 1949, sharing the stage at various times with Lester Flatt, Chubby Wise, Joel Price, Jackie Phelps, Benny Martin, and Mac Wiseman, and doubling as left fielder and third baseman with Monroe’s baseball club. Weak from a recurrence of malaria contracted in the service, Reno left the Blue Grass Boys and formed a band in South Carolina with nephew Verlon Reno. Later in 1949, he was called to Roanoke, Virginia, to work with Tommy Magness and the Tennessee Buddies. North Carolinian Red Smiley was already in the group. Reno and Smiley found that their talents meshed well and decided to team up as the Tennessee Cut-Ups in South Carolina. Their first 16 recordings for King were made in January, 1952, including their first release, “I’m Using My Bible for a Road Map.” By the time that enduring hit was released, the Cut-Ups had disbanded and Don Reno had rejoined Arthur “Guitar Boogie” Smith on radio and television in Charlotte. During the next decade, the Tennessee Cut-Ups were red hot in the southeast and mid-Atlantic, appearing on television in Richmond, Petersburg, Roanoke, and Harrisonburg, Virginia, and Washington, DC. The band’s alter egos — Chicken Hotrod (Don), Pansy (Red in a dress) and the Banty Roosters – were particular audience favorites. Don’s son Ronnie joined the band on mandolin in 1956, at the age of eight. In February, 1965, Red Smiley’s poor health caused him to retire from the road, just after Reno and Smiley’s first and only college concert, at Temple University. In September, 1965, Don Reno and his reformed Tennessee Cut-Ups appeared at the first multi-day bluegrass festival, at Fincastle, Virginia. There he announced a short-lived partnership with fiddler Benny Martin. From late 1966 to early 1977, Don Reno teamed with Bill Harrell. Red Smiley came back from semi-retirement and toured with them from 1969 until his death in early 1972. A variety of other musicians in this era included fiddler Buck Ryan and bassist Ed Ferris. Younger sons Dale and Don Wayne joined in the late 1970s on mandolin and banjo, respectively. The end of a legendary career came in October, 1984, when Don Reno succumbed to complications of diabetes. Pre-empted by Earl Scruggs as the first prominent three-finger banjo player during Reno’s World War II service, Don went on to create a distinctively different banjo style, featuring single-string and jazzy chordal phrases adapted from the guitar. First prominent flat-picking lead guitarist in bluegrass. With Arthur Smith, recorded top-ten hit “Guitar Boogie” on the guitar in the mid ‘40s and the original release of “Feuding Banjos” in 1955. Reno and Harrell were the first country act to perform at the United Nations in New York City. Could play banjo or guitar in any key without a capo. Mentored 14-year-old Hank “Sugarfoot” Garland in a twin electric guitar combo, 1948. None of the members of the Tennessee Cut-Ups were from Tennessee. In a hurry to cover another version on the market in 1955, Don recorded “Home Sweet Home” by himself – overdubbing three vocal parts, guitar, banjo, bass and snare drum. Released the single “Jimmy Caught the Dickens” as “Chick and his Hot Rods,” out of concern that Reno and Smiley fans wouldn’t appreciate the rockabilly arrangement. Not the most astute businessman, Don included reference to his disastrous used-car enterprise in “Your Mama Didn’t Raise No Idiot,” 1966. Sons Ronnie, Dale, and Don Wayne all went on to prominence in bluegrass and country music after performing with the Tennessee Cut-Ups. John Palmer, quoted by Gary Reid in the liner notes to Don Reno & Red Smiley and the Tennessee Cut-Ups, 1951-1959, King Records, 1993. “The Don Reno Story, Part 4: the Glory Years,” interview with Bill Vernon, Muleskinner News, December, 1973.